Successfully Added GPS Navigation and Car Audio System with 7 Inch Touchscreen to your Shopping Cart. GPS navigation car audio and video system with a 7 inch touch screen LCD and Bluetooth for maximum driving utility. Be the first in your circle of car stereo enthusiasts to have this hot new 1-DIN (50mm standard height) large screen car entertainment system with detachable front panel. YES, you read that right; a single DIN 7-inch state of the art car DVD powerhouse with security detachable faceplate! New to the marketplace, this 1-DIN GPS unit has a large 7" touch screen yet fits into a single DIN (50mm) space, meaning you can have a full functioning GPS navigator and car audio and video system that will easily DIY into any existing car. The GPS navigation system comes with an extra long 3m magnetic base GPS antenna for no hassle attachment and better satellite signal reception. It also features the Win CE 5.0 operating system which allows you to just pop in your SD card and run your favorite GPS navigational software and maps with ease. Hold on a second, someone's calling. No need to take your eyes off the road because your cellphone is Bluetooth paired up to the system, and you're listening to your caller through your car speakers. Pressed for time? Bring up a history of your missed or received calls and let the one touch dialing feature make life a whole lot easier. If you've been holding out for something better to come along, the time is now! Experience the four direction entertainment experience with the fully motorized and swivel angle large screen. Up, down, left, and right! Enjoy DVDs, MP3s, MP4s, radio or watch analog TV in style! 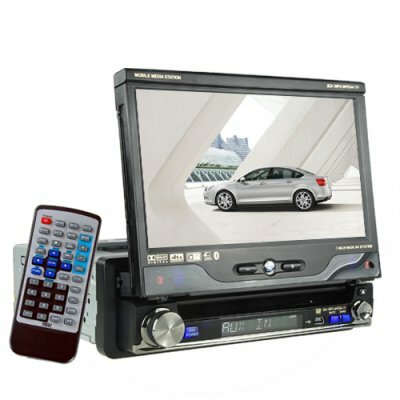 Pushing the boundaries of car DVD player innovation the CVSA-C06 is perfect for the resale market, VAR and OEM market, or personal use. Another amazing product at a low wholesale price from the original source for wholesale direct from China electronic products, Chinavasion. Does this unit come with antenna's? This unit comes with a magnetic base GPS antenna. For the analog TV function and AM/FM radio you can use your cars own antenna or buy a separate antenna (an antenna signal splitter may be needed to feed both the TV and Radio antenna inputs). on 2010-01-23 19:41:24 veeeeeeeeeeeeeeryyyyyyyyyy good!!!!!!! very fast delivery.very good product ,its amazing.gps works mls destinator 8 pro very good and fast.also destinator 7 and igo8. and many more. sound is very good.tv has many channels.and good quality. on 2009-09-23 19:12:19 A great device, with ultra fast gps and nice Sound. of this great device, cause is difficult to make changes on gps software (you have to dissassemble player from car frame). on 2009-09-01 19:40:51 Very Good. The delivery was quick and the product lived up to the expectations. I missed some general playing features but other than that great value for money. on 2009-05-21 01:53:09 Very Very good!! !